What kind of batteries does the CompactKit 7 use? Do I have to use batteries to power CompactKit 7? Why does my CompactKit 7 turn off by itself? On the LED readout on the front of the product, I can only turn the volume up to "11". Shouldn't the volume go up to "15"? Can I use CompactKit 7 as a USB MIDI controller with my computer? How do I change the MIDI notes my pads are sending via USB? How do I record my performance with the CompactKit 7? How do I change the voice of a drum pad or footswitch? How do I change the volume of a sound assigned to a pad or footswitch? 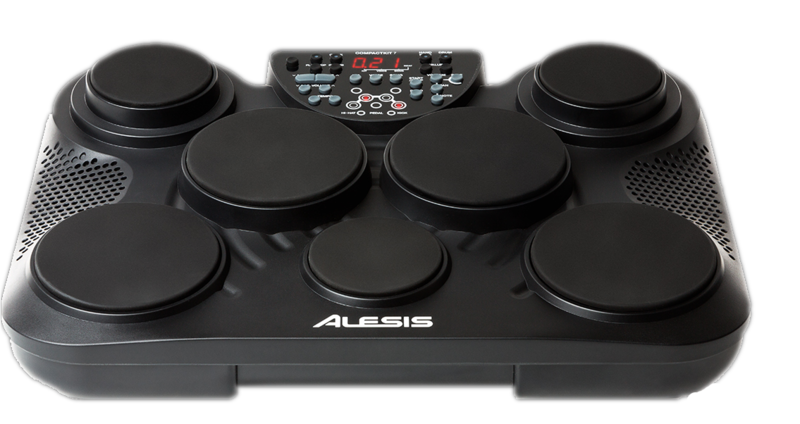 Where can I find further support for this and other Alesis products? CompactKit 4 uses (6) C batteries. No! You can power CompactKit 7 with batteries or with the included 12V DC 2A power adapter. Why did my CompactKit 7 turn off by itself? The CompactKit 7 automatically shuts off if you attempt to turn the volume up too loud. This is a safety feature to prevent damage to the internal speakers. If your product continues to shut off by itself, try adjusting the volume to a lower level. Wen the CompactKit 7 is plugged into a power source, the volume will go to "15". When the product is running off of battery power, the highest it will go is "11". You certainly can! Just connect CompactKit 7 to your computer's USB port and it will be recognized as a class compliant MIDI device. Select the desired kit, song, tempo, and reverb level (as described earlier). Also, if you want to activate or deactivate the drum part of the song, press Drum Off. Press Rec. Its light will flash. To start recording, hit a pad or press Start/Stop. The metronome will count off the tempo, but it will not be recorded. To deactivate the metronome, press Click. To stop recording, press Start/Stop. • If the memory is full before you stop recording, FL will appear in the display, and it will stop recording automatically. • When you record a new performance, it will overwrite the previously recorded performance. • When you power CompactKit 7 off, the recording will remain in the memory. Press Voice. A dot will appear in the display above Voice to indicate you are adjusting avoice setting. Hit a pad or press a footswitch to select it. Use the Value Down/Up buttons to select a voice (001–265) for the pad or footswitch. To change the sound of another pad, repeat Steps 2–3. Press Volume. A dot will appear in the display above Voice to indicate you are adjusting avoice setting. Use the Value Down/Up buttons to set the volume (L00–L31) for the pad or footswitch.